We went home from work last night without an idea of what to make for dinner. We’re between grocery shopping trips and have a hodge podge of different ingredients laying around. Little bits of cheese, a stockpile of rice, some tomatoes for sandwiches and dinners…we ran with it. 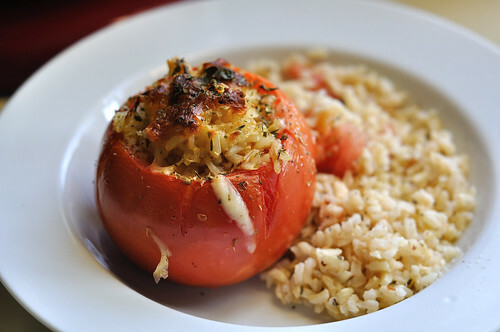 Stuffed tomatoes (or peppers) are nothing new around the foodie blogosphere and now I know why, they are delicious and easy and you can fill them with whatever miscellaneous ingredients you have laying around. 2. Cook rice according to directions. 3. Spray the inside of a cooking dish with cooking spray. 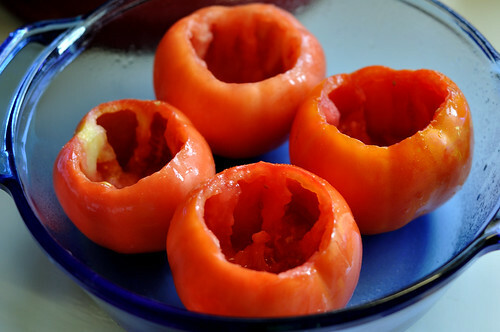 With a serrated knife, cut off the top of each tomato and scoop out the seeds and pulp. 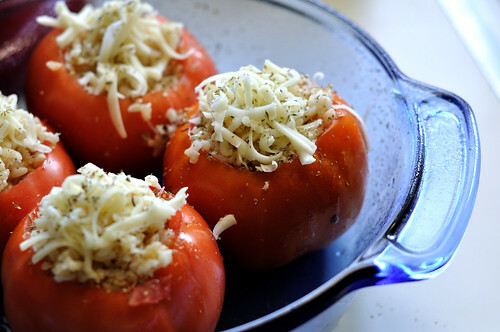 Sprinkle the inside of each tomato with a little salt. 4. Stir together the rest of the ingredients (except oil) and combine with finished rice. Stuff the mixture inside each tomato, mounding the tops slightly. 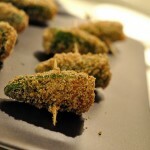 Drizzle olive oil over the tops and bake for about 25 minutes. We made four and each had two, but they’d also be perfect as a side dish. The only thing we wish we would have had was Feta cheese, as a sharper taste would have been a better compliment to the tomato than the mozzarella we had on hand. I definitely think a stuffed pepper night is in our future. these look delicious! i just found your blog and have the reeses chip peanut butter/chocolate cookies in the oven. they’re DELISH (though they didn’t spread at all… little ball cookies!) and i’m loving all of your foodie photos. thanks for sharing! 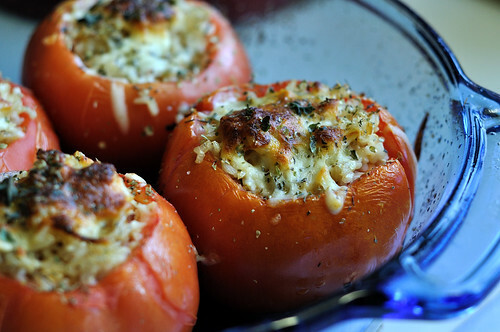 Lovely stuffed tomatoes! Both my husband and I are big fans of spicy dishes, and I’m sure we’d love this one. definitely going to try this one. I’ve tried stuff peppers, but never tomatoes. now that I’m gardening more I will definitely eat this one(since I love sriracha). Yeah, they’re a little more delicate than peppers, but worth it. As I said, I would use a sharp cheese or feta to balance out the tomato. Thanks for stopping by, how’d you find us? I think I found you from a blogroll of another frugal site. I don’t blog much about frugality, but it’s something that helped me when I was deep in debt and now that I’m not I can’t really kick the habit. I think frugality is a life-long venture, it’s a lifestyle. I know it’s definitely ours. Congratulations on getting out of debt though! The feeling is awesome, and as we continue to pay ours down, it feels better and better, a weight lifted. 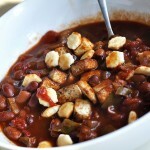 I found your blog via Tastespotting, looking for ways to use the tomatoes from my CSA box. 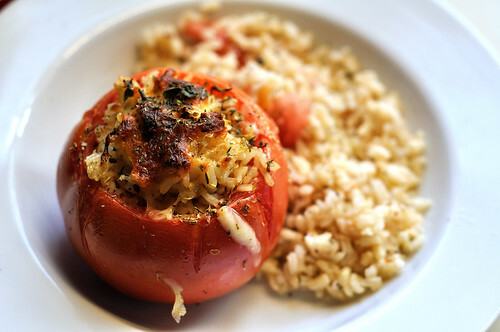 I made your stuffed tomato recipe this evening and it was wonderful! I used some leftover white basmati rice instead of brown, and cut back on the mozzarella a bit and added about a 1/3 cup of goat cheese (instead of feta) to add a nice little tang. 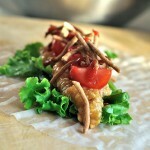 Very delicious! I’ll definitely make these again. this is exactly what I was looking for. 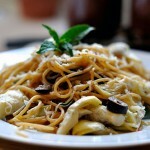 found you on tastespotting. thanks! !